Editor’s note: Credit for this post goes to contributor RWS. The maps at the end were added by me. After years of acquisitions, 3CDC had taken a major pause (update: other recent acquisitions) from land banking from 2009 through 2011. Looking at 3CDC’s OTR Work Group reports it seemed that the nonprofit had decided to focus solely on developing its current offerings & not expanding to new territory. Finally, after nearly 2 years with virtually no purchases, 3CDC purchased 5 abandoned buildings that have for years been a major eye sore to anyone traveling down Liberty, visiting Grammer’s or crossing between Vine & Walnut on 15th. 1508 & 1506 Moore St. The building to the right was purchased by an LLC affiliated with Urban Sites while the other was purchased by OTR Holdings (3CDC). Urban Sites purchased the building shortly before 3CDC’s larger purchase. It would be a fair assumption that they are planning to work together to redevelop all the units. 1447 & 1445 Walnut Street These units share a large open space with the Moore Street Properties (immediately behind them). Grammer’s is to my back in this photo. View from Liberty. Arrowed properties are now owned by 3CDC or Urban Sites. Also, all of the dirt/grass was picked up in this same purchase. The buildings in the back are owned by “Franciscan Homes IV” (30 W 15th Street) listing Denver Colorado as its main address, and “OTR-Walnut Street Housing” (24 W 15th Street) listing 421 E 4th Street as its main address. 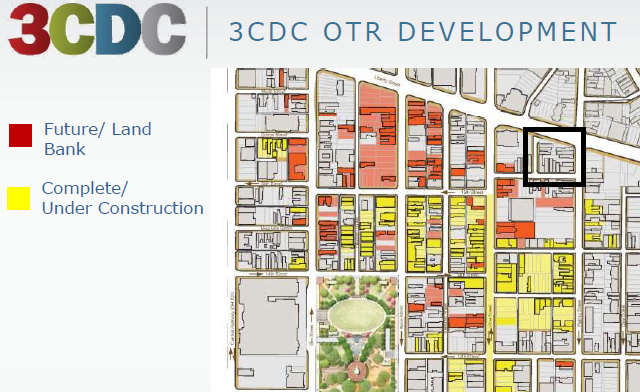 The OTR Work Group‘s January 2012 Report did not show the acquisitions on its map of 3CDC properties. The black box in the image below shows where these buildings are in relation to other 3CDC holdings. A major pause on landbanking? I follow this with interest and would hardly call their acquisitions since 2009 a pause. This list doesn’t even include anything that has been transferred to OTR Predevelopment. Sean, I added an update after the words “major pause”. This makes me super excited! I live at 1443 Walnut and I cannot WAIT for the squatters to be removed from 1445 Walnut and 1447 Walnut.